I have to say, I'm so very, very thankful for all of the kind words and comments about my Mother's passing. While it has not been an easy time for me, your words and thoughts brought me a great deal of comfort. It really means a lot that so many people wrote. I am deeply grateful . I'm glad I had the opportunity to write about my mother here, to share some of her story, and to introduce her, in a way, to all the readers of Kyle's B&B. There's so much I left out, but then, how can you capture someone completely in just a few paragraphs? Perhaps I'll continue to post about her every now & then, to fill in more of the details about her background, (like the fact that she was a Broadway queen, attending hundreds of historic plays during the golden age of Broadway. She also saved all the Playbills from those times, and what an amazing roster of performances she saw, such as Marlon Brando in "Streetcar", Robert Redford in "Barefoot in the Park", and many, many more). But for now, I just have to say thank you so much, again. 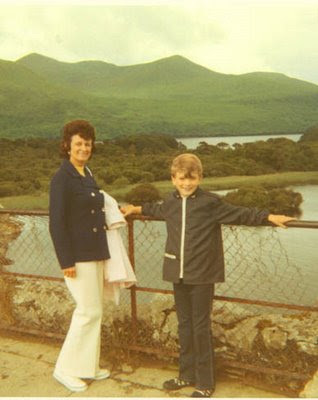 And here's one more photo, of my Mother and myself in Ireland, atop Ross Castle in Killarney. You may have noticed the new episode is not actually a "new" episode. Because of my mother's recent passing, things are still in the process of getting back to normal, and I needed some time to regroup. Hence, for the first time in Kyle's B&B history, I am running a re-run. Actually, a kind of sweet episode from several years ago, that, even if you've seen it before, you may enjoy it again. And yes, next time it will be back to new episodes! (Don't try reading it at this size, or you'll miss out on all the detail!). Click on the pic! I also wanted to say a huge THANK YOU to everyone who wrote me such sweet comments in regards to my Mother's passing. It really, really helped and I'm so deeply touched by the very kind words and thoughts. (In fact, I plan on making a separate post about this in a few days, but I wanted to say something here, too). Thank you so much, my friends.